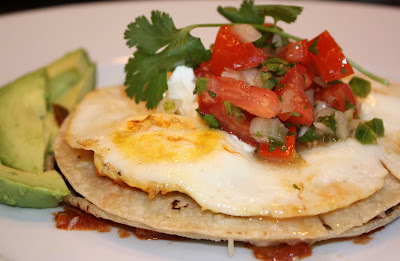 savory nest: Huevos Rancheros...Beyond Simple Eggs! When I think of huevos rancheros, I think of my brother. (Stay with me here...this is a compliment, not a visual observation.) You see, he absolutely loves this Mexican classic. It has been a Sunday-morning staple in his home for years, where he's served it up to his brood since the time they were in highchairs (or soon thereafter). I suppose my brother's early introduction of this south-of-the-border favorite ensured its standing as his signature dish -- strategically prepping the palates of his three children well before they might have dared to assume that this wasn't what everyone ate for breakfast. Having shared all that, I must admit that I had been "on the fence" about huevos rancheros for some time. I liked them but I wouldn't gravitate to them given another menu choice. I'm not sure why...never really thought much about it. Perhaps I considered them too exotic a breakfast fare...even with my Hispanic heritage (shame on me!). Whatever the reason, I just hadn't jumped on the same culinary bandwagon as my much beloved sib. In all fairness to my brother, who is an excellent cook and makes great huevos rancheros, I just wasn't branching out. I liked simple eggs, over hard, with a side of bacon and roasted potatoes. A good breakfast (or brunch)...sure enough...but also a bit boring. No sizzle. Huevos rancheros (meaning ranch-style or country eggs, in Spanish) are a whole lot more flavorful and interesting, for sure. Well...no more fence sitting. Like most all recipes we gather and try, sometimes we just need a little tweak to make us believers; to get us to branch out. These huevos rancheros are so "ooey-gooey" good (best I could come up with), I don't know WHAT I was thinking! My epiphany came earlier this year when, after an exhilarating Sunday hike, we stopped into a little cafe for brunch. Huevos rancheros were on the menu and, for whatever reason (perhaps thinking of my brother), I inquired about them (like I tend to do with most anything I consider ordering). And then I wait...you know...for even the slightest hint of doubt to cross over the server's face, erasing all chances that the menu item will be ordered. However, before my query had barely escaped my lips, he said their huevos rancheros were "the best thing on the menu" in his opinion. No flinch. No stumble. And, a personal recommendation! He was putting himself on the line...so noble...so brave. So I went with my gut and ordered them. That first order was about eight months ago and I now have them every time we go there...which is pretty often. So, what got me ON the bandwagon? Well, first of all, I do flip my eggs "over soft" so that the yolks aren't quite sooo runny (just a personal preference). Most takers still like theirs sunny-side up. (The important point here is that the yolks still have to have a little play in them.) And I really like the addition of the black beans and cheese, sandwiched between two warm tortillas and a part of the whole creation. Also, giving some attention to the beans (mashing some and adding a bit of salsa and seasoning) pays off in that they give the dish a bit more structure and depth...especially when partnered with a good salsa fresca, a side of fresh sliced avocado, and a dollop of cool sour cream. All the flavors contrast and complement each other so well, mingling like perfect little partiers at a fun fiesta. And, believe it or not, the presentation of stacking this dish works for me. It not only looks appealing, it keeps the whole lot together -- allowing you to cut it like a pie with a bit of everything in each bite. There are a variety of ways to make this dish, so personal preference is the simple key to success. It really just depends on what you like -- avocado, salsa, cilantro, sour cream, beans, cheese, potatoes, whatever. And you can keep it super simple by using a bottled salsa and canned beans. You can even find decent, pre-packaged salsa frescas in many markets (deli or dairy aisle). Whatever route you take, these huevos rancheros are truly delicious whether you make them for brunch, lunch or dinner. I made this version using both a bottled salsa and a homemade salsa fresca. I particularly like having a little thicker, warm salsa to layer down first as a foundation for the tortillas. (And, I like mixing in just a tad of it with the beans to give them a little more punch.) However, the bottled salsa only plays a supporting role here because the salsa fresca is the star that makes this dish shine. Its freshness offers the perfect counter-balance to the warmth and richness of the other flavors. 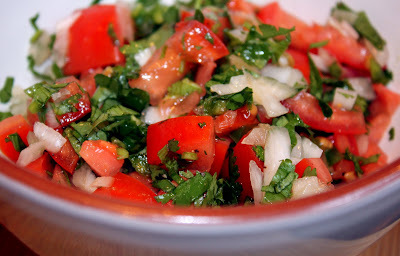 To make your salsa fresca, just mix fresh diced tomatoes, fresh chopped cilantro, diced white onion, jalapeno (seeded and finely diced...I used a half of a pepper), fresh lime juice (I used one lime), and salt and pepper to taste. I've found that people tend to be selective on their proportions of these ingredients so it's best to cut, chop and dice to your own liking. 1. Heat oven to 200 degrees Fahrenheit and place oven-safe plates in to warm. Fry tortillas in a pan (using a little olive oil, if you'd like) or heat them directly over your gas stove-top flame (without using any oil). Take extra care with this latter method as the tortilla can catch fire very easily. Wrap tortillas in foil and place them in oven to keep warm. 2. Heat 1 to 2 tablespoons olive oil in a skillet (the same one you used for your tortillas). Add onion and cook until just translucent. Add 3/4 of the black beans to pan. Empty remaining beans in a dish and coarsely mash them with the back of a fork. Add mashed beans and bottled salsa to the pan and continue cooking for another 1 to 2 minutes, until heated through. Add just a sprinkle of salt and pepper, to taste. Remove from heat and set aside. 3. Heat butter in a skillet over medium heat. 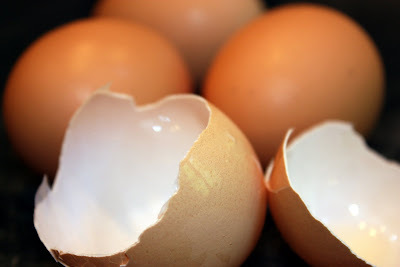 Crack eggs being careful not to break the yolks. If you prefer your eggs cooked "over soft," simply flip them carefully and quickly remove them from the heat so as not to harden the yolk. (You really do want a bit of the yolk to run to get the full flavor of this dish.) Or, just leave them sunny-side up and cook them a bit longer to allow the yolk to set up a little more. 4. Heat bottled salsa in the microwave (or on stove) and pour a bit on each plate. For each serving, spread a dollop of the beans on one tortilla, sprinkle with cheese, and top with second tortilla. Place "stacked" tortillas on plate, atop the spooned out salsa. Spoon a bit more salsa over the top of each stack and then place two eggs on each. Add a dollop of sour cream and a bit of salsa fresca. Garnish each plate with avocado and serve with a generous helping of additional salsa fresca.